Commencement is an important day, and one that our graduates long remember. Your desire to capture those special moments to cherish is something we certainly can appreciate. Buffalo State offers a number of ways to help out. Guests may not approach the stage or the graduate seating area to take photos or for any other reason. As a courtesy, a professional photographer will capture each graduate's special moment during the ceremony. Individual portrait photos will be taken of each graduate. Graduates who would like to receive a direct link to the photos, please visit Island Photography to register. You may register several e-mail addresses to allow your family and friends also to receive a direct link to your Commencement photo proofs, and there is no obligation to purchase photos. Please register by May 1, 2018. Images will be posted within 72 hours of your Commencement. Make all inquiries to Island Photography at (800) 869-0908. The Class of 2018 and their guests are welcomed to use the Commencement Garden in front of the Sports Arena as a photographic backdrop on Commencement day. The garden was established in 2000 to commemorate the first Commencement of the new millennium and continues as a favored photo spot today. There are a number of other scenic backgrounds on the Buffalo State campus, including two Bengal Tiger statues-one in front of the Sports Arena and one in front of the library. The Maud Gordon Holmes Arboretum features a variety of trees around campus that are in full spring bloom. Buffalo State Photography Services posts Commencement photos for free download here. 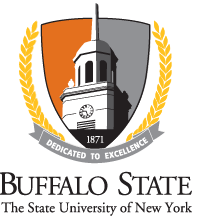 Buffalo State will capture your Commencement ceremony on video as a remembrance to share with families and friends. DVDs are $5 each. Visit the Creative Media Services DVD website for more information and to order.